Tedy Lacap Bruschi (/ˈbruːski/; born June 9, 1973) is a former professional American football player who was a linebacker in the National Football League (NFL) for thirteen seasons. He played college football for the University of Arizona, and was a two-time consensus All-American. He was drafted by the New England Patriots in the third round of the 1996 NFL Draft, and played his entire professional career with the Patriots. Bruschi won three Super Bowls and was a two-time All-Pro selection. Bruschi was born in San Francisco, California. His paternal grandparents were from Bedonia in Italy (specifically, the frazione of Bruschi di Sopra, while his mother is of Filipino ancestry. He attended Roseville High School in Roseville, California, where he lettered in high school football, wrestling and track and field (shot put). He was an all-conference selection as a defensive tackle for the Roseville Tigers. Bruschi attended the University of Arizona, where he played for the Arizona Wildcats football team from 1991 to 1995. In his four-year college career, he compiled 185 total tackles (137 solos), with 74 tackles for losses, six fumbles and recovered five others and tied the NCAA Division I-A sack record with 52 sacks. He was recognized as a consensus first-team All-American in 1994 and 1995, and won the 1995 Morris Trophy as the Pacific-10 Conference's best defensive lineman. In 1991, he missed the first three games of the season due to a pinched nerve in his neck. He returned and started two games as a true freshman, but suffered a broken left thumb and was redshirted. In 1992, he played strongside outside linebacker prior to his transition to the defensive line in 1993 and started just one of 12 games and still managed to post 4.5 sacks for the season. In 1993, he earned second-team All-America honors after setting a school record with 19 sacks as a sophomore, received first-team All-Pac-10 honors, and was named the Wildcats' most valuable player. His 27.5 tackles for losses and 19 sacks in 1993 were each career highs. In 1994, he was one of four finalists for the Lombardi Award and again was a first-team All-Pac-10 selection. He totaled 39 tackles, including 10 sacks and 15 tackles for losses. In 1995, he totaled 60 tackles (48 solos), including 18.5 sacks and 22.5 tackles for losses. Bruschi was elected to the College Football Hall of Fame in 2013. Prior to the NFL Draft, Bruschi was invited to play in the East West Shrine Bowl Game. The New England Patriots selected Bruschi in the third round (86th overall) of the 1996 NFL Draft. Coming into the draft he was listed at 6'0 250 pounds and was considered too small to be a defensive end but was a good size to be a linebacker, which is the position that New England coaches moved him. He played for the Patriots from 1996 to 2008. Bruschi never used an agent during his time with the New England Patriots. In 1996, he played in every game as a rookie, a pass rush specialist who played on many special teams units and finished the season with 11 tackles, including four sacks. He ranked third on the team with 17 special teams tackles, and ran a blocked punt back for a TD in October. Bruschi recorded two sacks in Super Bowl XXXI against the Green Bay Packers, just one shy of the Super Bowl record (Reggie White, 3.0). In 1997, he saw action in every game for the second consecutive season and posted 30 defensive tackles, including four sacks, and added 13 special teams stops. His four sacks and 13 special teams tackles each ranked third on the team, and he also forced two fumbles, and recovered one. In 1998, Bruschi played in every game for the third consecutive year and started the last eight games of the season, including the Patriots wild-card playoff game in Jacksonville (January 3, 1999). He finished fourth on the team with a career-high 81 tackles, including a pair of sacks. In 1999, he started 14 games at outside linebacker and recorded a career-high 138 total tackles, including two sacks. Bruschi finished second on the team in tackles, despite missing two games due to a right knee sprain. He made his first career interception, one of six passes defensed on the year. 2000 saw Bruschi start all 16 games at weakside linebacker and finished with 105 tackles (68 solos). It was his second consecutive season with over 100 tackles. In 2001, he started nine of 15 regular season games at linebacker and finished third on the team with 73 tackles. He was credited with two sacks, forced three fumbles, recovering one, and two interceptions. In 2002 Bruschi was voted a defensive captain for the season by his teammates. He ranked seventh on the team with 65 tackles (45 solos) despite missing five games due to injury. He returned two interceptions for touchdowns (at Oakland, November 17, and at Detroit, November 28), the seventh time a Patriot interceptor has reached the end zone twice in a single season and the first time a linebacker has accomplished the feat. In 2003 he started all 16 games at inside linebacker as one of four defensive players to start all 16 games and he was voted a defensive captain for the season by his teammates. He ranked second on the team with 137 tackles (87 solo) and finished third on the team with 16 pass defenses. He was named AFC Defensive Player of the Week in Weeks Two and 14. In the 2004 regular season, Bruschi finished second on the team with 122 tackles (84 solo) and tied for second on the team with three interceptions. His solid play continued in the playoffs, where he finished second on the squad with 23 tackles (18 solo) and added a sack, an interception, a forced fumble and two fumble recoveries. Bruschi was named the AFC Defensive Player of the Week three times in 2004: Weeks 4 and 17 and in the Divisional Playoffs, when he forced a fumble and recovered two fumbles as the Patriots defense held the highly regarded Colts offense to just three points. On February 16, 2005, just three days after playing in the 2005 Pro Bowl, Bruschi was taken to a hospital with symptoms including temporary numbness, blurred vision, and headaches; Bruschi was diagnosed with a mild stroke. He suffered from a patent foramen ovale, a congenital heart defect that leaves a small hole in the wall separating the left and right atria of the heart. Bruschi experienced partial paralysis and was admitted to Massachusetts General Hospital. After several months of rehabilitation working with Spaulding Rehabilitation Hospital in Boston, Bruschi announced he would sit out the 2005 NFL season. On October 16, 2005, the Patriots announced that Bruschi had been medically cleared to resume playing football; he rejoined the team on the practice field three days later. The Patriots officially activated him on October 29, and he played the following night against the Buffalo Bills; ESPN's broadcast of the game had several features and interviews on Bruschi's return. Following the game, Bruschi was named AFC Defensive Player of the Week. Bruschi played most of the remaining games that season, except for the final regular season game against Miami and the first playoff game against Jacksonville. Bruschi was named the 2005 NFL Comeback Player of the Year, an honor he shared with Carolina Panthers wide receiver Steve Smith. At the start of training camp, Bruschi broke his right scaphoid bone which he had surgery on August 8. He was listed as questionable, and didn't play in the first game of the 2006 season against the Buffalo Bills. Bruschi was voted a defensive captain by his teammates and started the final 14 games at linebacker. He finished first on the team with 124 tackles. In the 2006 playoffs, Bruschi led the Patriots with 24 tackles (16 solo), marking the highest playoff tackle total of his career. He also led the team with 23 tackles (15 solo) in the 2007 playoffs. In 2007 he played in and started all 16 regular-season games for the fourth time in his career and was voted a defensive captain for the 2007 season. He tied a single-game career high with a two-sack performance against the Cleveland Browns on October 7, 2007, and ran his career total to 30.5 sacks, becoming the 13th player in Patriots' history to reach that milestone. Also he led the team in tackles (99) and solo tackles (69) in 2007. In 2008 he played in 13 games, starting 12, and was named a defensive captain by his teammates for the seventh season. Bruschi was the first player in NFL history to return four consecutive interceptions for touchdown and his career total of four interceptions returned for touchdowns ranks second in Patriots history. He is tied for fourth in NFL history among linebackers, and Bruschi is the only Patriots linebacker to return multiple interceptions for touchdowns in a single season (2002 and 2003). Additionally, since 2002 Bruschi's defensive play has created seven defensive touchdowns. He scored four of those touchdowns on interception returns (two in both 2002 and 2003), forced two fumbles that were picked up and returned for touchdowns (October 3 and November 28, 2004), and tipped a pass that was intercepted by James Sanders and returned for a touchdown (December 11, 2005). This is in addition to his first career touchdown at Baltimore (October 6, 1996) when Bruschi recovered a blocked punt by Larry Whigham and returned it four yards for a touchdown, making 8 total touchdowns to which Bruschi contributed. On August 30, 2009, broadcast of Sunday Night Football, Al Michaels reported that Bruschi would announce his retirement after 13 seasons in the NFL. Bruschi confirmed his retirement on August 31, 2009 at a press conference alongside New England Patriots head coach Bill Belichick and owner Robert Kraft. During this broadcast, Bruschi described how fulfilled he felt in completing his 13 years of playing football. He described how it felt to know that he had reached all of the goals he wanted to reach. One writer speculated that Bruschi retired from the Patriots in the 2009 preseason, rather than being cut/released by coach Bill Belichick before the 2009 season. Bruschi joined ESPN as an analyst following his retirement. Bruschi has indicated that he would prefer that his number not be retired. It was worn by six-time Pro Bowl guard Brian Waters in 2011. Starting in 2012, his number 54 is now worn by Dont'a Hightower. The New England Patriots held a special ceremony in Bruschi's honor during halftime on Monday Night Football on December 6, 2010. On May 21, 2013, Bruschi was voted by fans as the 19th player to enter the New England Patriots Hall of Fame. Bruschi's Patriots Hall of Fame induction ceremony took place during halftime of a Thursday Night Football game between New England and the New York Jets on September 12, 2013. On February 1, 2015, Bruschi was an honorary captain at Super Bowl XLIX. Bruschi is of Filipino and Italian descent. An accomplished saxophonist, Bruschi has played with the Boston Pops. Bruschi is one of three children. His step father, Ron Sandys, was a professional tennis player. In 2007 Bruschi wrote Never Give Up: My Stroke, My Recovery, and My Return to the NFL, a book about his experience with his stroke and his recovery. 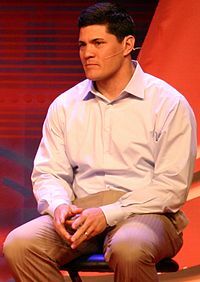 In his memoir, Bruschi speaks with candor about how his family confronted the reality of his life-threatening affliction, of his initial plans to retire from the NFL, and of the moment he told his wife he was ready to return to football, earning him a share of the Comeback Player of the Year Award and the Patriots recipient of the Ed Block Courage Award. Bruschi is a spokesman for the American Heart Association and founded Tedy's Team, a foundation to raise funds for stroke research, inspired by Bruschi's own experience. In 2007 Bruschi was named to NFL.com's All-Interview Team for accessibility to the media. In 2006, he won the Senator Paul E. Tsongas Award for Exemplary Public Service. In 2005, he was the Associated Press NFL Co-Comeback Player of the Year and was voted the Ed Block Courage Award, the Maxwell Football Club's Spirit Award and the AFC Defensive Player of the Week (Week 8) and NFL.com's All-Interview Team as well as USA Today's All-Joe Team. In 2004, he made the AFC Pro Bowl and Second-Team Associated Press All-Pro and was on NFL.com's All-Interview Team. In 2012, Bruschi ran in the Boston Marathon, wearing bib number 21677. He finished in a time of 5 hours, 26 minutes, 2 seconds. In 2019, Bruschi again ran in the Boston Marathon, this time in bib number 5454 (Bruschi and seven-time Monster Energy NASCAR Cup Series champion Jimmie Johnson (bib number 4848) both were given four-digit bibs featuring their squad numbers repeated), with a time of 4 hours, 35 minutes, 30 seconds. ^ National Football League, Historical Players, Ted Bruschi. Retrieved February 7, 2012. ^ "Celebrazione di Tedy Bruschi". gazzetta.it. ^ databaseFootball.com, Players, Ted Bruschi Archived April 20, 2013, at the Wayback Machine. Retrieved February 7, 2012. ^ National Football Foundation (May 7, 2013). "NFF Proudly Announces Stellar 2013 College Football Hall of Fame Class". FootballFoundation.org. Retrieved May 22, 2014. ^ Pro-Football-Reference.com, Players, Ted Bruschi. Retrieved February 7, 2012. ^ Elliot, Josh. "Every Team Needs a Bruschi". Sports Illustrated. Retrieved October 3, 2013. ^ Perillo, Paul (July 20, 2005). "Bruschi to sit out 2005". Patriots.com. Archived from the original on September 29, 2007. Retrieved June 25, 2007. ^ a b Tomase, John (September 8, 2006). "Tedy's back in line; Bruschi returns to practice". The Boston Herald. Herald Media, LLC via HighBeam Research. Archived from the original on April 13, 2016. Retrieved January 22, 2013. ^ ProFootballTalk: Tedy Bruschi will retire Monday | "There’s a good chance that Bruschi opted to pack it in at the suggestion of the team. Coach Bill Belichick surely didn’t want to have to cut Bruschi, and Belichick undoubtedly would have given Bruschi the courtesy of an opportunity to walk away." ^ Young, Shalise (December 7, 2010). "Bruschi honored for emotional career". boston.com. Retrieved December 7, 2010. ^ "Tedy Bruschi Elected To Patriots Hall Of Fame". May 22, 2013. Retrieved May 22, 2013. ^ "Tedy Bruschi Stats". ESPN Internet Ventures. Retrieved January 1, 2014. ^ "Pats' Bruschi leaves hospital". Providence Journal. December 18, 2005. Retrieved July 24, 2007. ^ a b "54 Tedy Bruschi LB". Patriots.com. New England Patriots. Retrieved November 1, 2013. ^ "Individual - Boston Athletic Association - BAA.org". April 16, 2012. Archived from the original on April 15, 2013. Retrieved April 16, 2012.